Monday, January 23rd marked the celebration of the Chinese New Year - 2012 is the year of the Dragon. 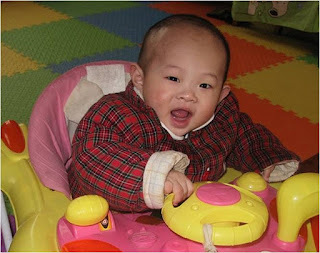 We recently received a quarterly update from Cooper's caretakers in China, and he has apparently been moved back into the orphanage. Our agency speculates that the move was likely due to his match with us as his adoptive parents, as China normally reserves foster situations for children who haven't been matched. We weren't happy to hear that he was moved once again, but we were extremely happy to learn that he is developing and growing. And we were ecstatic to see a photo of him with a smile on his face! That's the update from here. Happy New Year Cooper James! Ryan and I went to Montana and Wyoming for Christmas this year. We were able to spend a few days with my family in Billings and a few days with Ryan's family in Powell, WY. It was wonderful. The best gift we got was our official Letter of Approval from China. That means that Cooper is officially ours! It was so fun to share our excitement with our families. My mother and sister went crazy shopping for Cooper and it was wonderful to open their gifts. On Christmas Eve, Ryan's family surprised me with a baby shower. I had no idea what they were planning! I was completely in shock and of course started crying. (I've been doing that a lot lately too) Tears of joy of course! The first gift I opened was the car seat we had picked out. It had a doll in it that belonged to Ryan when he was a child. (see picture) Another very special gift was a recordable book. Ryan's grandma is 92, and it was a recording of her reading the story. So very special. I think about what a huge part of my life my grandmother was. I am so thankful that Cooper has all these people that already love him and they haven't even met him yet. Next Saturday we have our final home study with our social worker. We are also still filling out piles of paperwork to send to immigration. This process is overwhelming... I'm so glad that our adoption agency can walk us through it. I want to wish everyone a very happy New Year! I am completely in awe of all the support from you all. May 2012 bring you much happiness and love... I know it will for us!